Karin was an established wedding DJ before joining Stylus. Stylus reviews will be featured as they come in! A recent transplant to Brooklyn from Chicago, Karin comes to Stylus with over a dozen years of DJ experience and hundreds of weddings under her belt. Karin has spun at a wide range of venues, from world-class art museums to cocktail bars to street festivals. Her love for DJing started early, with her first pair of CDJs in high school. In 2005, she entered the world of radio, and has been on the air at several stations since. Karin is the host of Mashed Potato Time, a radio show highlighting the sections of her record collection devoted to early R&B, soul, girl groups, and garage rock. The show airs weekly in Chicago, Michigan, and online at lumpenradio.com. You can also find archived sets on MixCloud. During her frequent worldwide travels, she always seeks out the local record stores and has built up an eclectic vinyl collection. Between her work in radio and her habit of crate-digging, Karin’s cultivated an appreciation of everything from indie rock to trip hop, Tropicália to new wave, minimalism to exotica, classic country to pop guilty pleasures. Another of Karin’s greatest passions is volunteering. She’s devoted her time to many causes, including Girls Rock! Chicago, where she teaches DJ skills to young girls. Karin strongly believes that a wedding is all about you, the couple…not her! Her emcee style is straightforward, unobtrusive, and never cheesy. She loves crafting unique playlists catered toward a couple’s specific tastes, whether that means traditional Croatian dances or ’90s boy bands. A former event planner, she’s extremely organized and knows how important the little details can be for your big day. 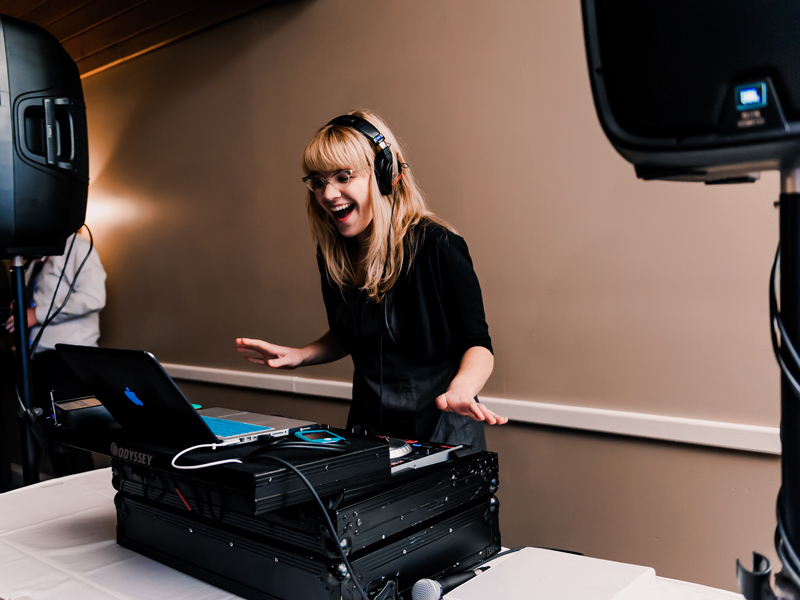 If you’re looking for a fun and easygoing DJ, Karin is the perfect person to keep your party going. Do you have any secret weapons? Yes - put us in touch!